Cover potatoes with salted cold water by 2 inches in a 5-quart heavy pot, then simmer, uncovered, until very tender, about 25 minutes. While potatoes are simmering, bring half-and-half, butter, salt, and pepper just to a simmer, stirring until butter is melted. Keep hot, covered. Drain potatoes in a colander, then immediately force through ricer into a large bowl. Stir in hot milk mixture, then horseradish. If you don't have a ricer or food mill, you can use a handheld masher, but the consistency of the potatoes won't be as smooth. 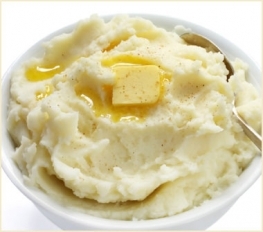 Mashed potatoes can be made 1 day ahead and chilled, covered. Bring to room temperature, then reheat in a microwave or double boiler, stirring occasionally.